I love US potatoes! Ever since I learned how to cook, potato has been a staple ingredient in most of my dishes. In fact, one of the first solid foods that I introduced to my now 4 year old daughter was mashed potato. I am glad I fed her with potatoes early on because I learned from research that there are many benefits in eating potatoes. Aside from bringing up a healthy baby, little did I know that eating US potatoes can also help in my active lifestyle. If you are on a perpetual diet like me, it is good to know that a medium sized US potato only contains 110 calories. So, make potato a part of your healthy meal today! 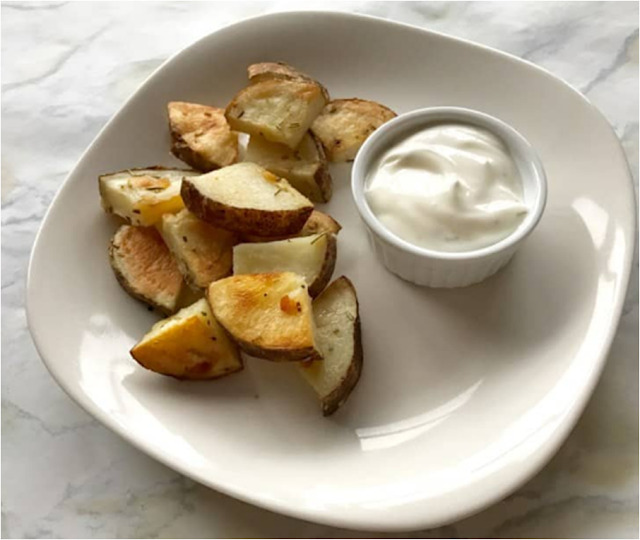 Toss US potato wedges in olive oil, 1 teaspoon dried rosemary, and a dash of sea salt. To serve, place US potatoes on a plate and use yogurt sauce as a dip. I hope you like this simple yet delicious US potato recipe that can get you going through the day. For more healthy potato recipes and to know more about US Potatoes, visit Potatoes USA Philippines Facebook page.